Spotting a trend in the early 1950s of staging summer theater in the round under tents, Clevelander John L. Price Jr. decided to give it a try. Consulting a local statistician to determine the geographical center of the culturally inclined population, the bull’s-eye fell in Warrensville Heights, a Cleveland suburb that was also the home to Thistledown Race Track. Price opened his Musicarnival there, on the grounds of the race track, with a production of Oklahoma! in the summer of 1954. The Music Went ’Round and Around tells the story of this unique summer theater and of its ebullient founder, John L. Price Jr.
Price’s venture was one of the last commercial legitimate theaters established in Cleveland. In its heyday the Musicar-nival had a capacity of 2500 and presented an average of eight to ten shows each summer. The backbone of the repertoire consisted of such musical classics as Carousel; Kiss Me, Kate; Wonderful Town; Fanny; Paint Your Wagon; and The Unsinkable Molly Brown. The summer schedule also featured popular solo acts, such as Louis Armstrong, Henny Youngman, Tom Jones, and even burlesque. Occasionally Price tried to sneak in an opera, letting the popular shows support these operatic flings. For the first eleven seasons Price principally used a resident stock company, occasionally bringing in a visiting star, if available and right for the role. Toward the end of the 1960s, however, Price was forced to adopt the star system to keep his tent filled. Dropping the stock company, he brought in packaged productions generally headlined by popular singing or television stars. Both offerings had strong followings, and Musicarnival kept the torch of musical theater burning brightly in Cleveland until 1975, when declining attendance finally forced its closing. 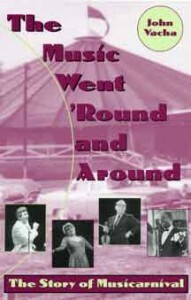 The Music Went ’Round and Around is the first book in the Cleveland Showtime Series. 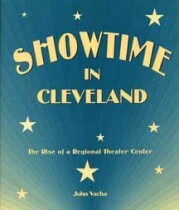 John Vacha received the Herrick Memorial Award from the Early Settlers Association of the Western Reserve, given in recognition of his theatrical history, Showtime in Cleveland (Kent State University Press, 2001). He has also written From Broadway to Cleveland: The History of the Hanna Theatre in the Cleveland Theater Series published by Kent State University Press.